We are getting closer and closer to finding out where China's Red Lines are when it comes to North Korea, and to put it in a nutshell, they're getting tired of the Norks. First, let's review what the Norks have been saying. North Korean state media warned on 11 April of a nuclear attack on the United States at any sign of American aggression. "Our revolutionary strong army is keenly watching every move by enemy elements with our nuclear sight focused on the U.S. invasion bases not only in South Korea and the Pacific operation theater but also in the U.S. mainland," it said. Chinese and South Korean leaders are concerned about the month of April because high profile events occur in North Korea in April and because North Korea likes to demonstrate its achievements as part of the annual celebrations. The most important celebration will come on 15 April, the birthday of the founder of North Korea, Kim Il-sung, who was born 105 years ago. The major concern is that North Korea will detonate a nuclear device in defiance of the US and that the US will strike North Korea’s nuclear facilities. The tension and mutual disdain have created conditions that nurture misperceptions, miscalculations and misadventure. In the past five days, the Chinese daily, Global Times and the official People’s Liberation Army English language publication China Military have published three commentaries on the North Korean situation. They provide authoritative insights about Chinese assessments of the North Korean nuclear program; China’s thresholds for military intervention; and the range of actions China might take. By 8 April, this commentary was removed from the web without explanation, but key excerpts were captured by Google. This commentary is unique and important because it re-affirms that under some circumstances China would take military action to destroy North Korea’s nuclear facilities and installations and would use the People’s Liberation Army to restore stability. The commentary listed four tripwires that could prompt Chinese military intervention in North Korea. 1. China will tolerate no pollution in northeastern China from North Korean nuclear activity. 2. China will not allow North Korean refugees to enter China in the event of internal turmoil in North Korea. 3. China will not tolerate a government in Pyongyang that is hostile to China. 4. The US must not push its forces to the Yalu River. The 7 April commentary explains in detail China’s meaning of pollution. The author wrote that villages in northeastern China already suffer from the consequences of North Korea’s nuclear tests. They have included buildings developing cracks and school closures. Pollution of the air, land or water from a North Korean nuclear test could cause “catastrophic and irreversible” damage to Chinese provinces that border North Korea. In that event, the commentary said, the Chinese will use all means available to strike back at North Korea, including military force. 1. North Korea’s nuclear infrastructure is fixed and its sites are well known. 2. An attack that destroyed the facilities would permanently suspend the nuclear program because it has no capacity to absorb an attack and rebuild. 4. North Korean leaders will panic if the nuclear facilities are destroyed. China will not accept North Korean refugees resulting from internal turmoil. Instead two Chinese Group Armies have plans to create refugee isolation zones inside the North Korean border, according to the commentator. The other two conditions – no government hostile to China and no US forces on the Yalu – were not explained. Neither condition exists now. The commentator wrote that, no matter what happens, China has a bottom line that it will protect at all costs, which is the security and stability of northeast China. The title of this article reveals that some senior Chinese leaders were concerned on 7 April, the day of the cruise missile attack on Syria, that the US might decide to attack North Korean nuclear facilities on the day after the Syria attack. This commentary is intended to check that impulse. The commentary is the second time in my experience that China has stated its tripwires for action and the actions it will take in North Korea. This is a genuine statement of deep policy. I also judge that its publication, however briefly, is a measure of how serious the Korea confrontation is becoming, in the view of Chinese leaders. Three of the conditions for intervention are long standing and have not changed since the mid-1990’s when North Korea experienced its most serious internal crisis since the Korean War. They are: no refugees; no hostile government in Pyongyang; and no US troops on the Yalu River. The context for those three conditions was that between 1994 and 1996 the North Korean economic and political systems were in danger of total collapse from the ravages of unprecedented flooding, followed by drought and the worst famine in North Korean history. Estimates of the numbers of North Koreans who died from starvation range from 500,000 to more than two and a half million. No refugees. The Chinese indicated then, and since then, that they will not support a North Korean refugee population on Chinese soil. That has been a constant of Chinese policy towards North Korea. Even now, defectors are returned to North Korea or handed to South Korea. They are not allowed to remain in China. In a crisis, the People’s Liberation Army would prevent border crossings and would supervise large safe zones inside North Korea. No hostile government. The condition about not allowing a hostile government refers to a situation in which the Kim administration has collapsed, been murdered or abdicated. This condition has two primary interpretations. One is that China would intervene to install a puppet government in Pyongyang. China supports a community of high level defectors from North Korea who could lead an alternate government and security forces. The other interpretation is that China would tolerate a South Korean-led administration in Pyongyang as long as it was friendly to China. US troops on the Yalu. Concerning the movement of US soldiers, this also presumes that Allied forces would move into North Korea to prevent the spread of chaos, disease and refugees from a North Korean collapse or defeat in a war. One interpretation of this condition is that in a breakdown situation in North Korea, no Allied troops would be allowed to enter North Korea. Another interpretation is one that I favor, that China would not allow US troops to reach the Yalu River, but would accept South Korean troops on the Yalu. China might not oppose US soldiers as far north as Pyongyang to help stabilize North Korea. The most important difference is the latest confrontation involves the destruction of nuclear weapons. This Global Times commentary is the only article to state that China, or at least some senior Chinese leaders, are willing to use military force to destroy North Korean nuclear weapons in the event of pollution. Pollution. China has made enormous investments to develop northeastern China. The writer’s comment suggests that the Fukushima and Chernobyl nuclear disasters, and worse, were on his mind. Nuclear fallout over the northeast could be catastrophic for China’s economic future. The four assertions about the North Korean nuclear program and the effects of its destruction appear to be the key points in an internal argument, rather than a settled government position. The key premise is that the North Korean political system is so linked to the survival and policies of a single man – Kim Jong Un -- and so rigid that his eclipse and the destruction of his prize accomplishment – the nuclear and missile programs -- would bring down the entire communist political architecture. There are contrary arguments. The commentator does not mention the real danger that North Korea might lash out against China and South Korea with whatever forces remained intact. The notion that North Koreans would become obedient after a Chinese invasion also seems fanciful. On 11 April, China Military published a commentary that asserted the dark judgment that war is inevitable as long as North Korea continues its nuclear and missile programs. The only question is when. The danger of war arises from a sudden attack designed to achieve surprise or from an accident. This commentary asserted that 70 years of Allied military exercises have failed to modify North Korean behavior. The author listed four things that North Korean leaders need to know and urged countries with access to impress them on the leadership. 1. North Korea’s nuclear arsenal and missile are too small to present a credible deterrent. North Korean leaders misunderstand their enemies. Also, the North Korean dual pursuit of economic development and nuclear weapons, the so-called byungjin strategy, is a fantasy. 2. North Koreans need to know that sanctions will never be lifted as long as they have a nuclear weapons program. As a corollary, the author wrote that China and Russia do not see eye-to-eye on many issues, but on the North Korean nuclear issue, they agree. North Korea cannot play one against the other. 3. North Korea does not understand the power of the US. North Korean nuclear weapons might cause some physical damage to the US, but North Korea would be wiped out. It would cease to exist. 4. The only and best path to security for North Korea is to voluntarily surrender its nuclear program. The commentator concluded with the assertion that the North Korean nuclear problem must be settled soon to avoid war. He estimated a window of four years at most. China Military is an official publication so its views carry weight. This is the first time that I have found a Chinese commentary in English language open sources that denounces the state strategy of North Korea – byungjin, translated parallel development. It also is the first to present a candid Chinese evaluation of North Korea’s so-called nuclear deterrent. The North Koreans hold as a matter of faith that US soldiers will flee a North Korean ground force attack and that the US government will sue for peace if the North Korean forces can quickly inflict several thousand casualties on the US forces in Korea. Alternatively, they believe that a nuclear explosion on US territory will cause the US to sue for peace. The Chinese message to North Korea is that its leaders need to stop believing their own propaganda. Global Times Editorial, 12 April. This item focused on sanctions. The author wrote that more restrictive international sanctions have strong backing by China. They can include restricting North Korean oil imports. This editorial is the first to mention that China would support restricting oil imports. North Korea is totally dependent on oil imports, most of which come via a large pipeline from China through Sinujiu to the Ponghwa Refinery in northwestern North Korea. China has stopped or reduced the flow through the pipeline in past crises, but usually involving bilateral relations or failure to pay for the oil. Taken together, the three commentaries provide rare glimpses of Chinese crisis management thinking and planning about North Korea. They contain messages for all regional actors. Most importantly, they convey the message that Chinese crisis managers have the North Korean situation in hand and that there is no need for a unilateral US attack. If an attack is needed, China has the plans, capabilities and intention to deliver it and some unique trip wires. The three also are instructive about the ripple effects of an attack against North Korean nuclear installations. The immediate consequences will be severe and China’s to cope with. The articles demonstrate that Chinese leaders have thought deeply about and fully understand the burdens they might have to shoulder. A number of points merit repetition in conclusion. Some Chinese military leaders judge that war is inevitable as long as North Korea possesses nuclear weapons. China has plans and intentions to use military force against North Korean nuclear facilities under some circumstances. One of the trip wires for intervention is not military at all, but pollution and fallout from a nuclear test that damages China. China is determined to maintain regional stability at whatever cost. China will support and enforce even stricter sanctions against North Korea. (Mother Jones) This is from Mother Jones, possibly the most 'progressive' rag in the news magazine business. There are bits that I cut but I left quite a bit in, because it ads to the interest of the article that I'm sharing. It's the Jet that the newsies loved to follow. The jet's history can be pieced together from news clippings, human rights reports, and Federal Aviation Administration documents. 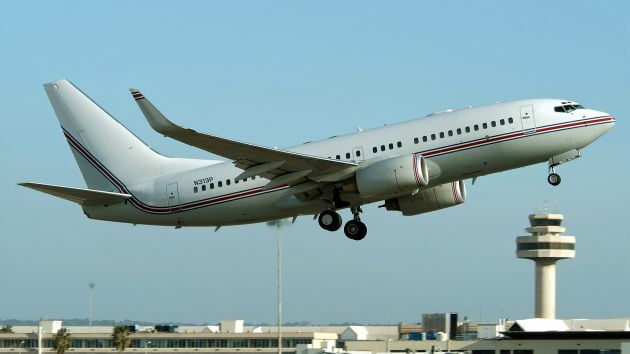 In 2006, the Chicago Tribune reported on a specially modified 737 with the tail number N313P, which had been observed flying between the Middle East, Europe, and the United States. The paper linked the jet back to the CIA through a series of front companies around Washington, DC. One of those companies was Premier Executive Transport Services, which had taken ownership of the new plane in May 2002. The Washington Post found that the names of 325 people ostensibly affiliated with this shadowy company could be traced back to five Beltway-area P.O. boxes. When reporters searched for some of those names in public databases, what little they could turn up was a bit spooky: "Although most names were attached to dates of birth in the 1940s, '50s or '60s, all were given Social Security numbers between 1998 and 2003." 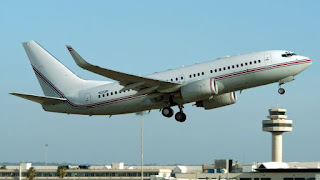 During its time with CIA-linked companies, N313P flew all around the world, landing in spots like Morocco, Afghanistan, Libya, Uzbekistan, and Guantanamo Bay. In September 2003, it touched down at a remote airport in Poland. As the Tribune later suggested, this trip may have had something to do with the Polish intelligence complex in Stare Kiejkuty, which the European Court of Human Rights later found housed a secret CIA site. Before the release of the Senate intelligence committee's 2014 report on the CIA's post-9/11 detention and interrogation program, the Washington Post reported that American intelligence officers had probably abused and tortured detainees at the black site at Stare Kiejkuty. N313P landed near Stare Kiejkuty at least once. For those of us who travel, the fluctuating price of a seat on an airplane is annoying. Seat pricing is controlled by an algorithm in a computer and it is set to match supply and demand. I flew from Ontario, California to Dallas, Texas the other day on late notice - same day turn-around - first class on American Airlines, on five day notice. The price of the return ticket was $2000.00. There weren't any coach seats remaining and I had to get there for business, so the customer paid the freight. It's part of the price of a face-to-face meeting. I have another one tomorrow but it's in San Diego, CA. Cheaper for them, easier for me. Recently United Airlines had the Chicago Police Department pull a passenger (69 year old doctor) from an aircraft bound for Louisville, bloodying his face in the process. The video is viral and I won't post it here. The stock price dropped $1.5 billion as a result. Nobody wanted to give up their seat, so the airline chose the passenger off. CEO Oscar Munoz says that he stands with the employee decision to evict four paying passengers to that 4 crew members could dead-head it to Louisville. If they want to do that, they need to stop the passengers at the gate. But if they can adjust what they are willing to charge, shouldn't passengers be able to hold out for the highest bid? Eventually United would have found a taker at somewhere less than $1.5 billion. The 69 year old physician will heal and his financial compensation for pain, suffering and inconvenience will be in the high seven figures, which is nothing compared to the loss of $1.5 billion to United. They could have paid passengers up to $1,350 to vacate their seats but they didn't. The policy to send in the police, beat up the old man and haul him, bleeding, from the airplane didn't win the "Friendly Skies" any awards for customer service. I ordered a custom trailer to haul the Ducati Diavel and a yet to be purchased dirt bike around. It was delivered today. I'd install the Condor wheel chalks for the motorcycles tomorrow but I have to work. 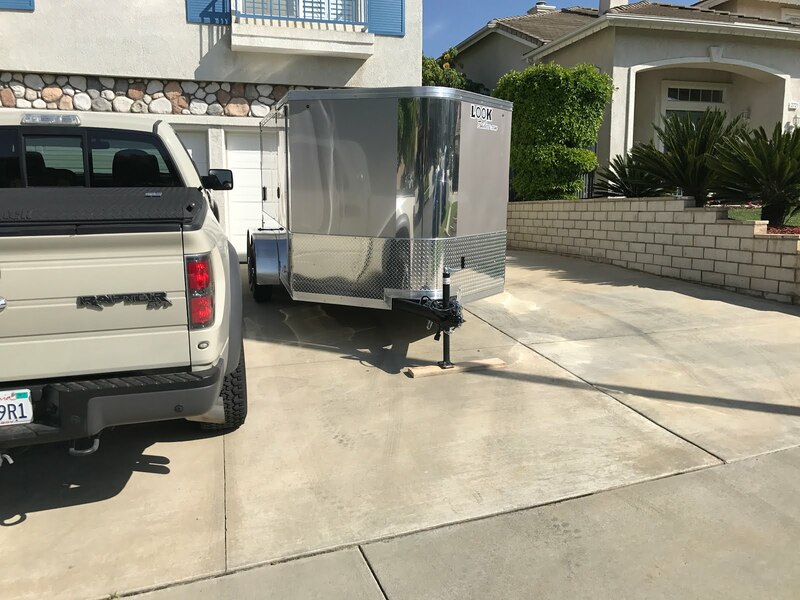 My concept is that while I like to make runs on the Diavel, getting a bit closer - like 1,000 miles closer - to the destination in a trailer and then unloading the bike and riding around would be far less stress. 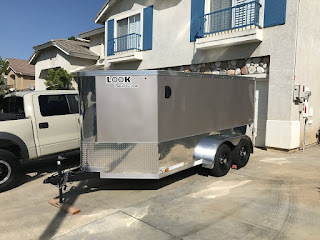 This Look Trailer is 12' x 7' and it's low enough to fit in the garage, which will eventually be it's storage place. Hauling the Devil is one of my retirement programs which is finally being realized. I understand that it's a trivial thing, but I'm excited about using it this coming summer. There are plans to take it to Canada in Summer 2018 for a run. If I'm still blogging then, I'm sure that it will appear here on Virtual Mirage.